Very warm and comfortable. But it is very large which we were looking for and due to the size it took 4 cycles in the dryer after wash to completly dry and was very wrinkled. Give your bedroom a simple and clean allure with the Madison Park Rianon 3 Piece Cotton Waffle Weave Comforter Set. The 100-percent cotton comforter and shams feature a waffle weave that provides a soft textured look and feel. Decorative wood button details adorn the face of the comforter and shams for a charming and functional accent. 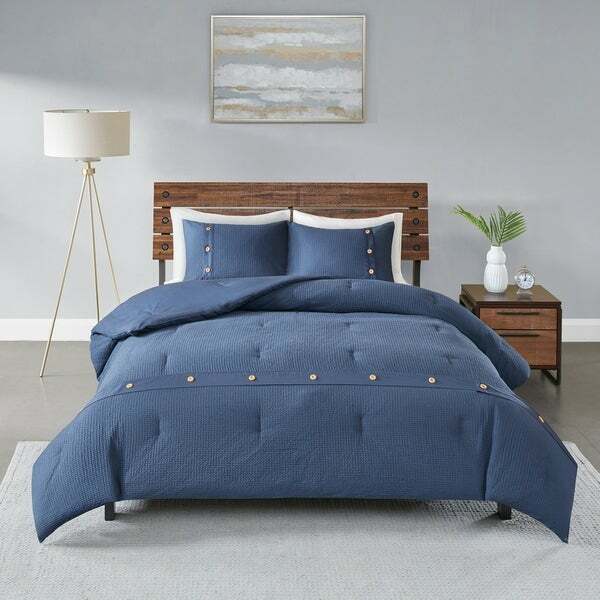 With a fresh contemporary style, this navy comforter set is machine washable and pairs perfectly with any bedroom decor.